Bees, they work in wondrous ways and we get to benefit from the fruits of their labour. I'm looking at you, Teddy Bear jar filled with honey! You sweeten my tea, naturally. But what about the remnants? I'm glad you asked. 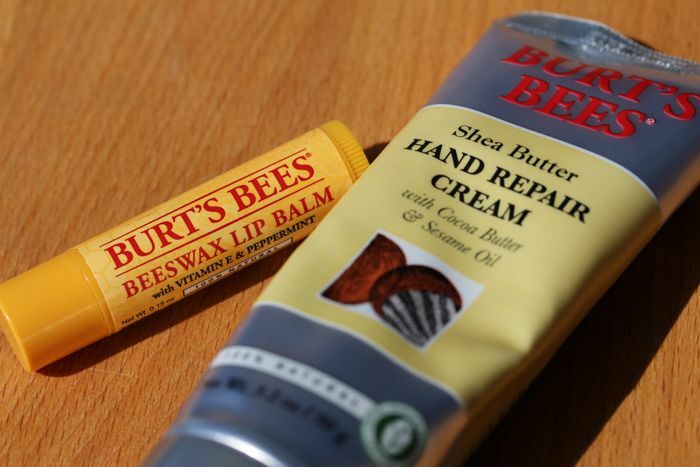 Burt's Bees Beeswax Lip Balm (say that three times, fast) -- the Beeswax locks down moisture, while the Peppermint tinge serves as a treat for the nose and the lips and Vitatmin E serves as the conditioner. A recycled plastic tube filled with goodness awaits to work hard for your smacker. Deep beneath the scent of peppermint lies a smoky, almost medicinal note which I attribute to the presence of rosemary. The consistency is far lighter than many other chapstick brands I've used over the years; a thin film coats the lips and only lasted for a few hours. Lana Del Rey soft without the bee sting (*cough* filler) puffiness. Just wish it had SPF. Now, the Shea Butter Hand Repair Cream. Hmm, not gonna lie, but this stuff is pungent. It smells like clay mixed with craft paste (the kind used in Kindergarten) and Calamine Lotion. Truth be told, I have a bit of a ritual -- after I apply my hand lotion I love to take a quick whiff, it's sort of my own Mary Katherine Gallagher thing. Despite being left with soft hands, I just can't get past the nostril flaring sensory overload. It's Mother Nature in the form of a tube. Yes, I'll go sit in the corner now with my stinky, silky, smooth hands. 5 out of 10 bags for the Shea Butter Hand Repair Cream — can we infuse it with something sweet like vanilla? Burt's Bees Lip Shimmer is effortless and perfect for low-maintenance gals and for lippie newbies.